There is much to see! A great site, thank you for this Master Arthadan! A nice link, Master Arthadan. Vey inspiring indeed. In this case for me! How could you know that . . . So, you're in a "Gondorian mode" Master Turambar. Then let me show you also the bridge of Osgiliath by the same talented guy. Ah, didn´t see that, although I have spent hours teher already . . .
You're welcome! Just in case you also miss his Haradrim Fortress, here you are. 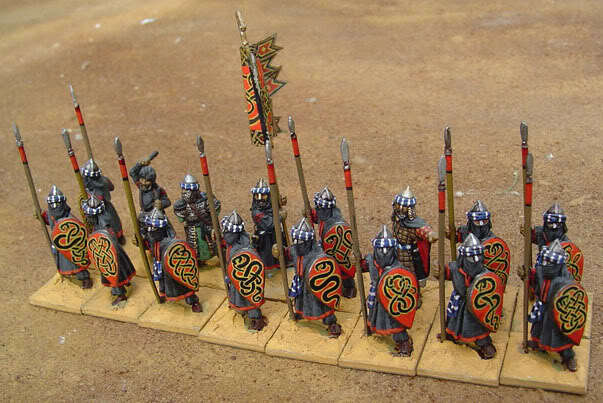 And now his nice mumakil conversions and his inspired Haradrim fanatics. he's got talent, that's for sure! By the way, his nickname is Sukhe_bator and the photos are from the Lead Adventure forum. 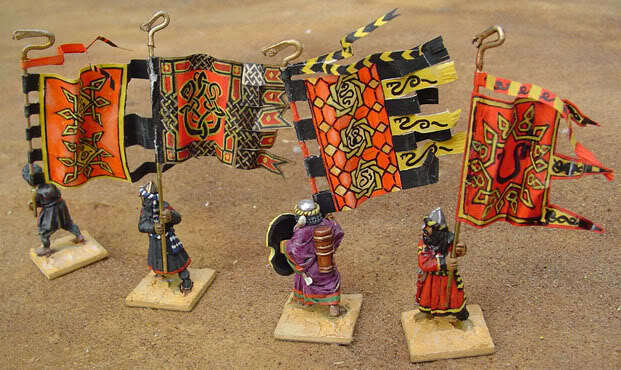 Very interesting page, and great dioramas... thanks for this Master Arthadan.... I specially like Haradim fortress.... great piece ! WOW. Those examples are quiet fantastic. Seems, that I have to overthink not only my shield design, butthe flag design aswell ! Really fantastic examples and a fine webside also! well met! I only hope I can do justice to my venerable Mithril Rohirrim so they can join the fray with my other LOTR armies on the fields of Pelennor. Unfortunately in a moment of teenage rashness eons ago I clipped the supports from the front legs of my horses. Now years later they have buckled and several rear legs have broken under the combined weight of horse and rider. I now have to consider adding clear plastic struts or other supports to keep them from drooping - have you any suggestions? Master sukhe, if the legs are broken of drill a hole through the base plate into the leg (0.5-0.7mm dia) and put a wire in as a support. If you cover the base plate with grass etc you also can use wire covered with grass to support the front legs to bring back the stability! Excellent advice. In the past I've also tried altering the galloping pose so the front hooves touch the base plate and glueing them in place. When I revisit these minis I will consider all options. Now my expertise in such things has improved I was considering reestablishing the lost support to the front legs with a thinner wire as you suggested. As long as the end result does not detract too much from the minis I'll consider anything! I missed this topic before. Your shields and standards are just wonderfull. And fortresses you have made are huge projects ! bravo. I've also not been paying attention, and had missed this material appearing on the site. You're a very gifted guy, Master Sukhe-bator. This quality of work is the reason that none of my own will ever appear in public! But where on ea do you find the time? And buildings too! I'm humbled.